With that background on SLAPP lawsuits in mind, I come now to today's topic, the Thomas Cooley Law School. 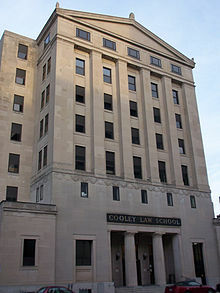 A private law school based out of Michigan, with four Michigan campuses and a new one in Tampa, Florida, the Cooley Law School is the largest law school in the country with 3,129 part-time and 535 full-time students. It also tends to rank near the bottom of most law school rankings. With tuition over $34,000 a year, students of the law school often graduate with law school student loan debt in excess of $100,000. Law students graduating today are finding a job market saturated with newly-sworn in attorneys looking for legal work. Even students from the top law schools and top students from the average-ranked law schools find themselves struggling to find a place in the legal job market. For so-called fourth (bottom) tier schools like Cooley, it is extremely difficult to find work as an attorney. What can we say about a law school, whose purpose is to train future lawyers, that doesn't believe in the fundamental right of freedom of speech under the First Amendment? Rockstar05, who feels Cooley is unethical and lacks any sense of institutional integrity, is highly critical of Cooley's absurd claim to being the nation's second best law school after Harvard. He points out that of 193 American law schools, Cooley ranks 160th in the first time bar exam pass rate of its graduates, even after the bottom 25 percent of first year students are flunked out; 181st in graduate employment rate; and 190th in student-faculty ratio. But in its self-ranking, Cooley uses a number of strange criteria, such as library seating capacity. As it is, there is a glut of lawyers, with only 27,500 jobs for 44,000 graduates in 2009, for example, and law schools rake in millions of dollars in federal guaranteed student loans. Cooley, with a main campus in Lansing and satellite campuses in Auburn Hills, Ann Arbor, Grand Rapids and Riverview, FL, is the country's largest law school, with 3,129 part-time and 535 full-time students. I haven't warned people about the dangers of enrolling at Cooley for the same reason it would be a waste of time to warn a parent that it's a bad idea to hand a 15-year-old boy a bottle of Jack Daniel's and the keys to a new sports car. Some things are so obvious that it's pointless to belabor them. Nevertheless, there is something potentially useful about reviewing Cooley's employment stats at the level of detail that is now available through the efforts of people such as Law School Transparency, in something of the same way it's useful to show 15-year-olds gruesome films of alcohol-related car crashes. In that spirit, let's compare Cooley's stats to, say, Stanford's, on the working assumption that the outcomes SLS graduates obtain are the kinds of things people borrow $115,364 (this was the average law school debt taken on by 2011 Cooley grads) in high-interest non-dischargeable loans in order to be able to do. One of many useful things law schools tend to fail to teach their students is that lawsuits are often filed for reasons that have nothing to do with actual legal rights and wrongs. A classic example is a strategic lawsuit against public participation (SLAPP). The point of a SLAPP suit is not to litigate valid legal claims but rather to censor critics, through legal intimidation. It is something of an irony that the first exposure many current law students and people considering going to law school will get to how a SLAPP suit works is being provided by the suit Cooley has filed against the attorneys representing former students suing the school, and the even more preposterous suit the school brought against four scam bloggers. For instance the law school is suing "Rockstar5" for defamation and wrongful interference with its business relations. As a strictly legal matter, the complaint against Rockstar5 is very weak. For example, it claims the author is defaming Cooley and its representatives by calling them "criminals." The specific passage in which that word appears criticizes the school for admitting people who shouldn't be in law school, and allowing them to spend $50,000 per year in tuition and living expenses, even though such people "don't have a shot in hell of practicing law." The author then says, "Congrats you criminals, you have accomplished robbery!" You don't have to be a lawyer to realize the author is not literally accusing Cooley's administration of robbery, but rather is employing a metaphor to state his opinion regarding what he considers the ethically dubious character of Cooley's business model. Indeed with trivial exceptions, almost everything in the post is either a matter of undisputed fact or the statement of an opinion-neither of which can form the basis for a valid defamation suit. But SLAPP suits have little to do with legal rules, and everything to do with the economic rule that rich and powerful institutions can employ the legal process to crush dissent, by burying critics in a blizzard of litigation expenses. Cooley's real problem has nothing to do with supposed defamatory claims on what, until it filed this suit, was a profoundly obscure blog, and everything to do with what has been dubbed the the Streisand Effect. The Streisand Effect got its name from an ill-fated lawsuit brought by the famous singer against a photographer who published a photograph of her Malibu house on the Internet. Streisand's suit backfired when publicity regarding it led to the photograph being viewed by hundreds of thousands of web surfers. Cooley is getting more on-line publicity than ever these days, such as for example this blog post, pointing out that the school's founder, "Professor Emeritus" Thomas E. Brennan was paid more than one million dollars between 2007-08 and 2009-10 for what even the school characterizes as less than ten hours per week of "work." Brennan's days seem to be in significant part filled by authoring a blog chock full of classic cranky old man rantings about, among other things, how The Gay is destroying the nation's moral fiber, while being paid more than $700 per hour (this assumes a 52-week work year) to compile "Judging the Law Schools," Cooley's very own ranking system, which in its 2010 edition is gracious enough to allow Harvard to deny Cooley the honor of being ranked the top law school in America (global and inter-galactic rankings are not yet available). Regular readers of this blog realize I have zero tolerance for SLAPP lawsuits filed by deep-pocketed plaintiffs hoping to squelch critics by forcing them to expend tens if not hundreds of thousands of dollars defending themselves in a lawsuit that the plaintiffs know will in the end prove unsuccessful. Judges should not condone the abuse of our legal system in an attempt to stifle a person's free speech. As the victim of a SLAPP defamation lawsuit myself, I sympathize. As long as legal fees can be collected via such suits, no attorney who's a legislator will vote in favor of doing away with this lucrative business. every school has its own law and one thing more is this is not a bad law this is a good law.Dissertation provider | Affordable dissertation | plan dissertation | Want academic writers | dissertation proposal writing service online | dissertation topics writing help online. Your essay is pretty informative! Browsing your work has educated me. Discovered a lot from it. I will favorite your webpage and will pursue to go through your new blog posts. Terrific! Thanks a lot! This website is excellent and so is how the subjectresep makanan diet matter was explained.makanan sehat untuk anak I also like a number of the comments too.Ready for subsequent post.